← The Retro Was Strong at the Smithsonian’s SAAM Arcade 2017 in D.C. I was playing Pearl Harbor again, and it was like being in 1983 for a few moments. I could almost hear The Kinks playing in the background. And, as it happened, I wasn’t the only one who got thrown back to the ’80s thanks to BASIC Month. 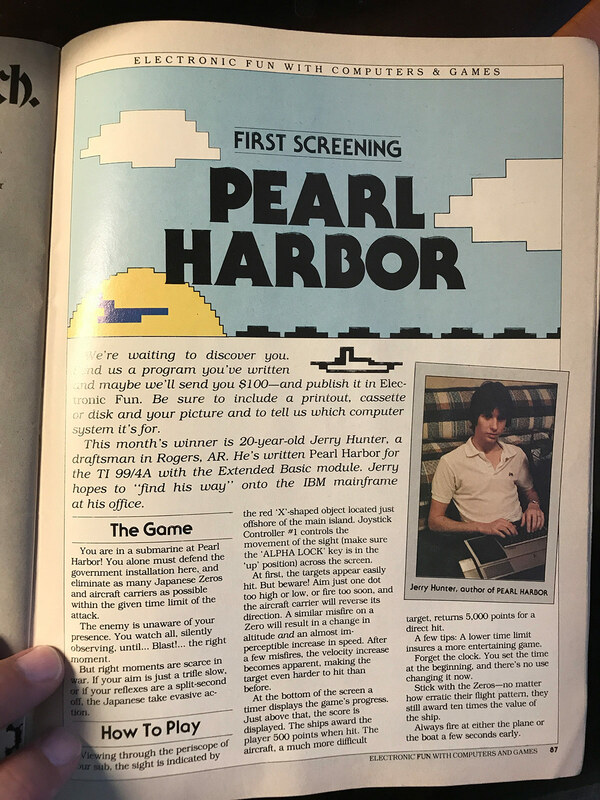 The magazine ran a little writeup and photo of the author of Pearl Harbor (who got $100 for submitting the program and being chosen for publication), a 20-year-old guy named Jerry Hunter from Arkansas. I took a video of the game running on my ’99 for the BASIC Month entry and thought about, from the author’s perspective, what a crazy, out-of-the-blue thing it would be to see someone typing in and running a BASIC program you wrote three and a half decades ago, here in 2017. Since this guy was programming at this level back in 1983, I figured there was a good chance he would have an online presence today. So, I started searching for his name online. I found a number of matches in and around Arkansas, but I couldn’t narrow it down and I wasn’t seeing email addresses associated with the names. Adding in a clue I saw in the program listing, and after a few hours of searching over several days, I came up with a likely address match. So, I sat down and actually wrote this person a letter, put it in an envelope, included photos of the magazine and program listing, and mailed it. Jerry had got in touch and told me in no uncertain terms how tickled he was to have gotten my letter. He then took me through his eclectic and downright amazing 35 year career since Pearl Harbor. First off, the TI wasn’t his first computer. That was an ELF-II kit (around 1977). A TRS-80 followed, along with an Atari 2600, 400, 800, 600XL, and 1200XL. An Eagle-II running CP/M came next, as well as a CoCo and the TI-99/4A. Though he really needn’t have clarified it, Jerry tells me he was an “extreme geek,” at that time. As for his career, to pick a few highlights readers would enjoy, a month after Pearl Harbor was published he was hired on at Wal-Mart as their first ever non-degreed computer programmer. 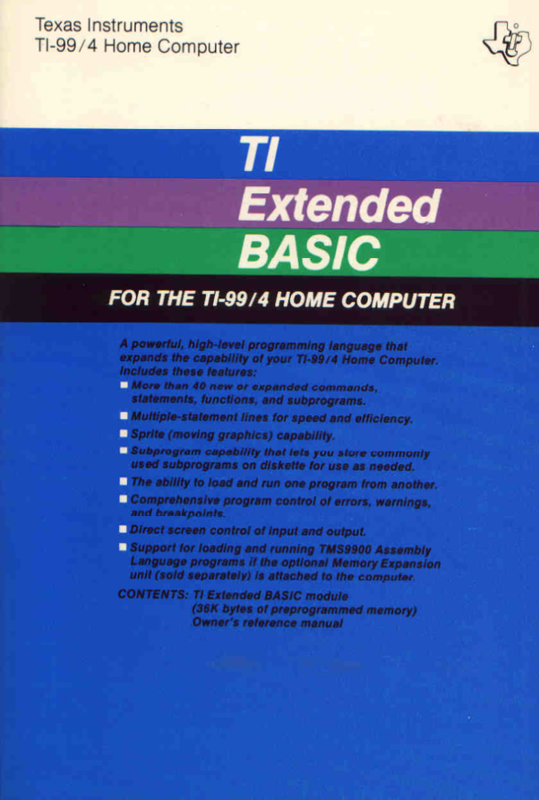 He bought an IBM PC to be able to program at home (poor little TI-99…). At Wal-Mart, his Telxon project led to the first large-scale deployment of barcode technology in retail and to him writing the first two FM wireless digital data transfer protocols (P-TAP and R-TAP). Before long, I found myself at the center of a complete technology revolution. I was the first installation of the IBM PC-LAN product outside of IBM development, and tested and evaluated other networking products before choosing Novell Netware. The entire world was changing so fast, and my wireless protocols were taking the world by storm. He met Sam Walton who got him into flying and inspired him to think big when it came to business, as did various industry giants he met through his association with Walton. He was motivated to make a huge impact, and worked towards that in his programming. …in the evenings, I was still playing with experimental code, learning the basics of AI and flex-code, communications between machines, and countless other things. In 1984 I wrote “ThunderCode”, a 4GL code-generation product which enabled the user to draw their user interface, and it in turn wrote BASIC source code which could quickly be dropped into a business application. Also in 1984 I wrote CBSIM, a doorware (add-on product) for RBBS, which became the first multi-user chat system for public-access BBS systems. I also began writing code that functioned as a graphic terminal protocol (because I believed the BBS world deserved better than ANSI graphics). Jerry left Wal-Mart in 1986 and over the years that followed he ran many successful businesses across a variety of areas. He currently owns the global technology firm USFleetTracking, which he started in 2005. And he recently bought an airport. Of the technologies he developed that readers may be familiar with, DarkStar BBS, the first multimedia BBS platform, stands out. In a world of ANSI graphics, DarkStar incorporated up to 800×600 graphics, mouse drive, and the use of BMP, PCX, GIF and JPG images, FLI/FLX video, WAV audio, supported editable menus similar to RA or QBBS (except in graphics mode). With no employees, just myself, I sold 3,200 copies of the software at prices ranging from $99 at first, eventually reaching $249. Given the course of his storied career, I really think that Jerry needs to write a book. I hope readers have enjoyed this somewhat unusual post. I’ve certainly enjoyed the events that lead up to writing it. BASIC Week at r/Retrobattlestations along with a 35 year old computer magazine brought me a rather fascinating glimpse at the career of an individual who has made a real technological impact — and several, at that. This entry was posted in r/Retrobattlestations, TI-99 and tagged BBS, programming, texas instruments, TMS9900. Bookmark the permalink. Went to a DarkStar canoe trip in Noel, Missouri and after that went back to Rogers(?) Arkansas and played Terminal Velocity on his home LAN… was a great weekend! Pretty cool to see all he has accomplished over the years!! It’s a blast to get in touch with the people who created so much joy and excitement for you all those years ago. I wrote a blog post 10 years ago on how much I enjoyed Compute! Magazine (https://tekkie.wordpress.com/2007/10/31/reminiscing-part-3/), and I got comments from some of the old hands at Compute! Along the way, I posted videos on YouTube of my favorite games out of the magazine, and I’ve gotten comments to them from the authors of those games. It’s been great. I even got to meet Tom R. Halfhill, one of the editors at Compute!, in person, when I happened to be in his neck of the woods (Mountain View, CA) back in ’09. That’s an experience I’ll never forget. The moral of the story is many of the people who created this stuff are still around, and they love getting in contact with people who still appreciate their work. People do that stuff all the time. Look, I never took a class in programming. I was self-taught. I learned the old-fashioned way, from reading books. In fact, most colleges and universities didn’t even offer degrees in programming or computer science back then. Perhaps a class or two as part of a mathematics program, but degrees in computer science were only available at the high-end schools like Dartmouth (which nobody _I_ knew could afford). NO, it wasn’t easy. In fact, I’ll tell you flat-out, it was HARD. But that’s okay, because it was also FUN. Hard gives you the satisfaction of knowing you accomplished something nobody else could (up to that point). I mean, when you really stop and think about it, there were no cell phones, the IBM PC was a relative newborn (November of ’82), and the whole world lay ahead of us, hungry for technology, an entire generation of us bottle-fed on George Jetson and Steely Dan’s IGY. Heck, I’m still waiting for hovercars to hit the market – weren’t we promised as kids of the 70’s they would be here by now? And what about “that wheel in space” I was supposed to be able to buy a ticket to? How AWESOME it was to be an entrepreneur with a programming skillset in the early 80’s! A world of opportunity, and the path that lay ahead was as clear as day… or was it? The internet as it exists today wasn’t even imagined in the 80’s – back then, it was only FTP and Telnet. There was no graphic protocol, no web, no web browser… and it was simple to be the first in any given category. There was nothing we couldn’t do. Start an online store, a search engine, serve up amateur video, chat systems… To steal a line from Tom Petty, “the future was wide open”. That was then. Looking back, it feels as though colonists have bulldozed and developed every square inch of land, right? The internet is flooded with me-too apps and websites and blogs, and any legitimate innovation wouldn’t even be noticable among all the noise and trash out there. When you consider how far we’ve come, it really IS miraculous. You have a customizable stream of news in your pocket, instant connectivity with your friends, an encyclopedia you can query with spoken words, movies you can watch on your phone – on your frigging PHONE! The guys at NASA put a man on the MOON with far less computing horsepower than what you have on that phone in your hand right now. Here’s the deal: Right here, right now, TODAY is the best time in all of human history for you to learn to write software.